PREA sets a standard that protects the Eighth Amendment rights of Federal, State, and local prisoners making the prevention of sexual assault a top priority. It also increases available data on sexual misconducts and sexual assault. 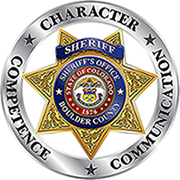 The Boulder County Sheriff’s Office supports the prosecution of persons who commit acts of sexual misconduct in its facility. The Boulder County Jail has developed uniform guidelines and procedures to reduce the risk of in-custody sexual assaults and sexual misconduct. The Boulder County Sheriff’s Office is committed to a zero-tolerance standard for sexual misconduct and sexual assault. If you were the victim of a sexual assault while in custody, or if you know of an incident of sexual assault of a person while in our facility we urge you to report the incident by using the electronic form below. Your anonymity will be protected. If you fail to report an incident, you could be found to have acted with deliberate indifference towards the victim’s health and/or safety. If you file a false report it could result in criminal charges. All reported incidents will be investigated. You will be contacted, but you may still remain anonymous.